Acute on chronic liver failure (ACLF) is a serious liver failure with 70-80% mortality. Current management of the liver failure is rather poor, due to deprived understating of the pathogenesis. It is quite likely that there are several factors, which could play a role in the pathogenesis of ACLF. Current work in ILBS has lead to a major breakthrough in discovery of beneficial effects of G-CSF in increasing survival in ACLF patients. Additionally, a proteomic approach has lead to identification of serum markers which appear to be promising in the prognosis of ACLF patients. ACLF is characterized by a high mortality rate caused by multi-organ failure (MOF) and available therapeutic options are limited. Liver transplantation remains the only definitive therapy for patients with ACLF, however, limited availability of the donor organs, prohibitive costs limit its usefulness in the management of patients with ACLF. Other than liver transplantation, liver regeneration through bone marrow derived stem cells may be important in ACLF. Research group at ILBS has observed the potential of Granulocyte-colony stimulating factor (GCSF) therapy to improve the bone marrow stem cells to the liver, which further increase the survival and decrease the end stage liver disease (MELD) score in ACLF patients (Fig. 1). 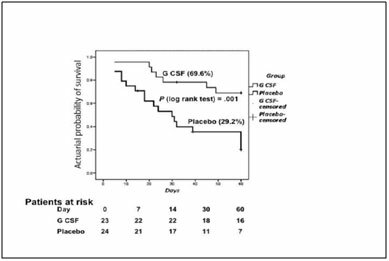 The novel randomized controlled study clearly demonstrates the distinct clinical benefits with prolonged G-CSF therapy for patients with acute-on-chronic liver failure. With its ease of administration and potential benefits of hepatic regeneration, in vivo G-CSF therapy merits further evaluation in patients with ACLF. The few available prognostic models for decision-making in ACLF conditions for conventional medication or liver transplantation are usually far from being very satisfactory. Hence, there is a need for identification of newer markers for prognosis and treatment modality. In view of this we undertook a quantitative proteomics based approach to explore and to identify candidate circulating plasma biomarkers for prognosis of ACLF patients with and without multi organ failure (MOF). In our discovery phase, with LTQ- orbitrap mass spectrometry and high resolution mass spectrometry approach we have now identified transferrin and labile iron pool as a potential candidate circulating biomarker in ACLF . Intriguingly, in ACLF patients with MOF we found a significant decrease in the circulating levels of hepcidin, which plays a crucial role in iron homeostasis. In conclusion our studies are indicative of dysregulated iron metabolism, due to alterations in hepcidin levels, to distinguish ACLF patients with or without MOF.